After we left Sabi Sands we flew from Skukuza to Port Elizabeth via “Joburg”. Airlink, the regional SAA carrier did not have a baggage agreement with British Air, which was our second leg. As such, we had to collect and recheck bags in Joburg with an 80 minute connection. A mistake by the wholesaler our safari agent used to book our domestic airfare but it all worked out fine! We picked up our rental car near dusk in Port Elizabeth. 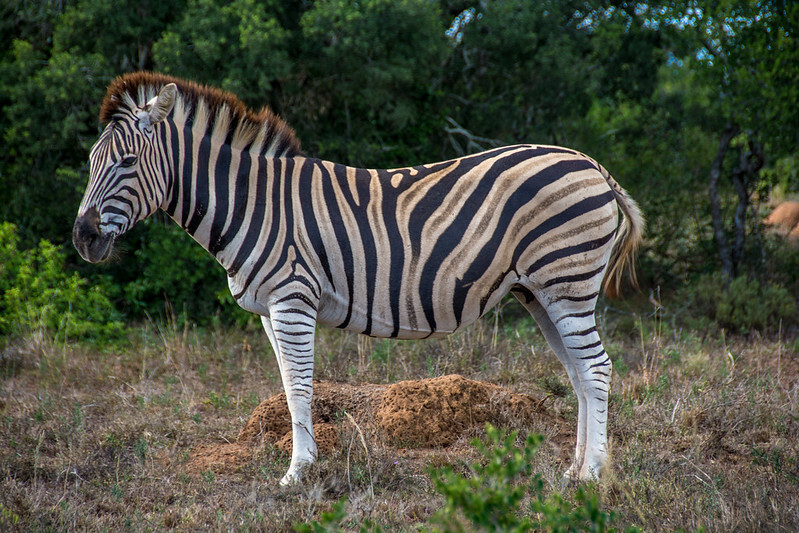 A very harrowing 50 km drive to Addo through Motherwell a poor section where people jaywalk in 60 mph traffic with no lights and dark skin. 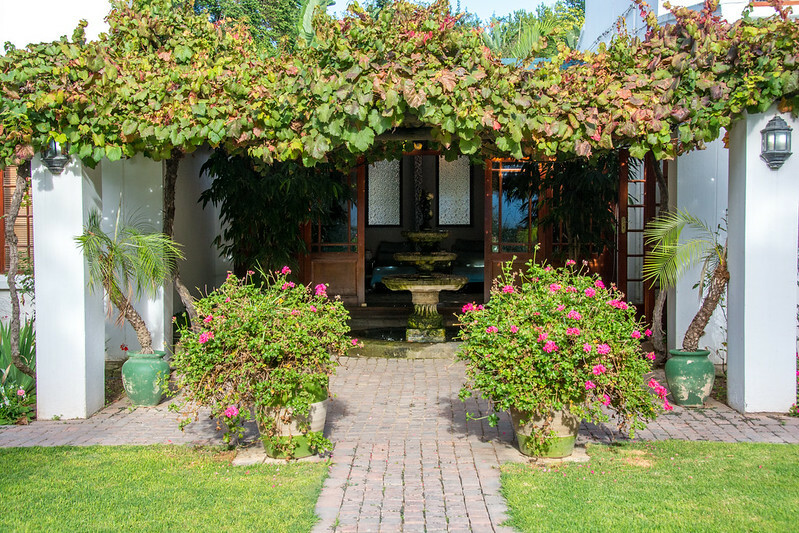 We arrived unscathed at Woodall Country House, a beautiful spot about 8 km from Addo National Elephant Park. We had a wonderful dinner and a sound sleep after a long day of travel. The next day after breakfast we took the car up to the north gate of Addo. We didn’t have high expectations after our safari but remained open minded. Immediately after entering we saw a watering hole on the left with a solitary elephant and a few Cape Bufffalo. Warthogs were EVERYWHERE! We cruised to the famous watering hole where the elephants “came out around 11” according to Ruan, the ranger at Woodall. It was called Hapoor Dam and the parking lot was full of cars but no elephants. We cruised to the picnic area and Kadouw lookout which had some amazing vistas (insert photo link) and some zebras sleeping right next to the road. Back to Hapoor and still no elephants (only warthog families at the “beach”). SO we drove on to the next watering hole: Marion Baree. Jackpot! Two to 3 dozen elephants of all sized enjoying a rather small narrow strip of water. Saw some miscellaneous game as we departed the south exit. Disappointed that we had our trunck inspected as people apparently do hunt and kill wildlife within the park. Onto the N2 and onto Knysna, 3 hours away. The last two drives were amazing. It just keeps getting better and better. We saw a pride of lions sleeping from 25 feet, a solitary hippo sunning himself and two male elephants fighting at dusk. On the final drive, we learned how the different lodges work together and communication on a clever series of radio channels. We had just left on the final morning (Monday April 18) and we got a call from Lion Sands, a neighboring property. 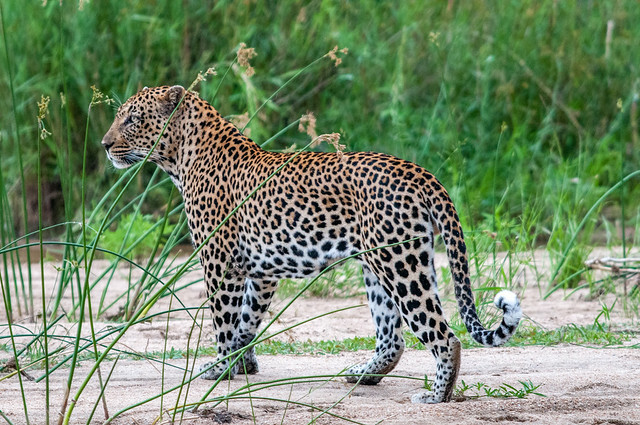 Each property has its private land within Sabi Sands and owners have reciprocal rights with other properties to look for game. 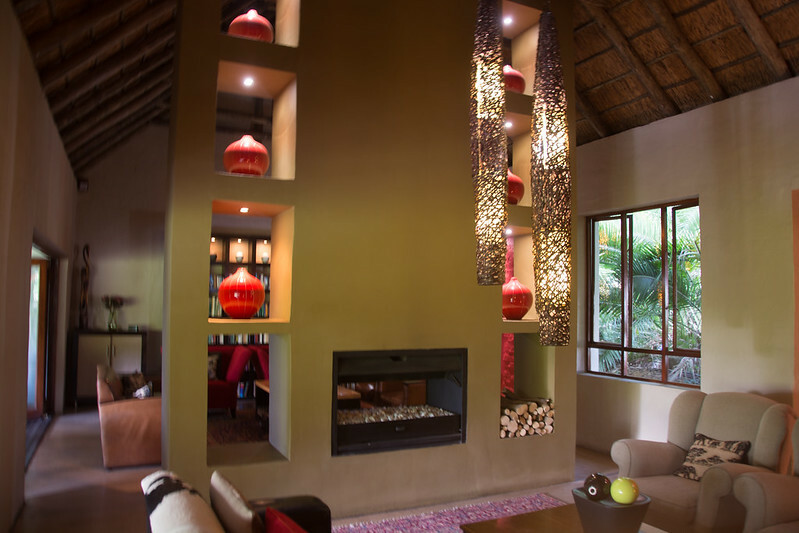 The call was from Lion Sands Ivory Lodge on the Kingston “farm”. 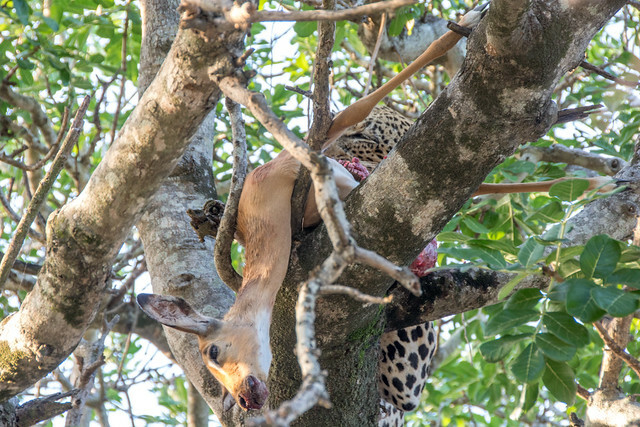 More on “farms” later :).There was a male leopard who killed an impala during the night and was high in a tree eating it. We were standby 3. The person making the sighting organizes the order in which subsequent vehicles will pull close to take photos. Twenty minutes later we arrived as standby 1. The vehicle left and we tried to get angles to take photos. First angle below, more on Facebook. Later we stopped as we always do at a spot for coffee in the bush. It was a beautiful watering hole. 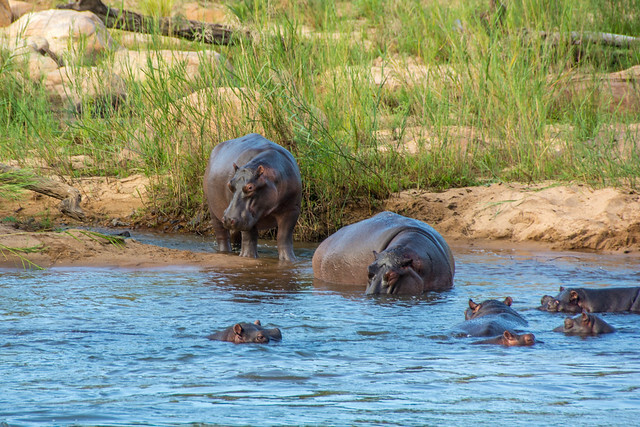 We were joined by a dozen hippos watering themselves as shown below. 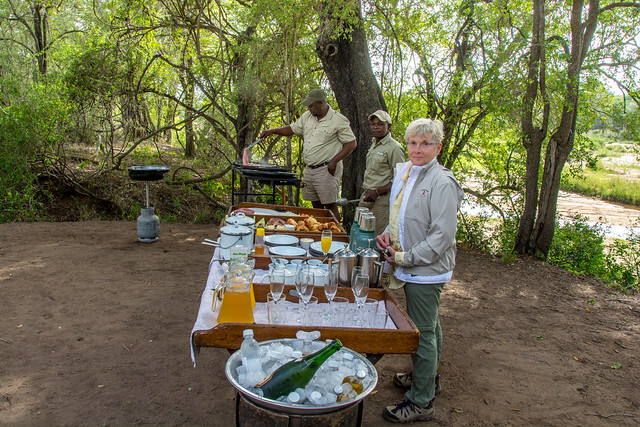 Then, to end the trip, we had a surprise breakfast in the bush with white linen, champagne and the typical (I know by now three cities later) breakfast of scrambled eggs, grilled half tomato, mushrooms and onions. It was a magical way to end a magical trip. More photos on facebook here… Flickr large size upload still problematic. 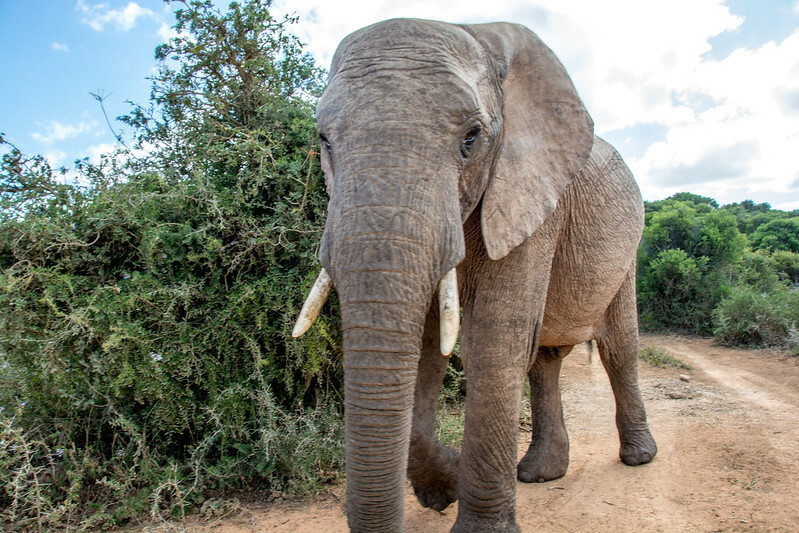 Next post from Addo National Elephant Park..
We have had a wonderful time so far. Its Sunday midday and we have two drives to go before we fly to Port Elizabeth to begin our tour of the garden route. Each day has been up at 5:15 on first drive before 6 AM for 2.5 to 3 hours, return for breakfast and then rest till 3:30 and drive until sundown or a bit after. Then drinks with your ranger and dinner. Dinner alternates between family still in their boma and sit down plated meals. Food is fabulous, lots of local fruit growers. The lodge is wonderful. 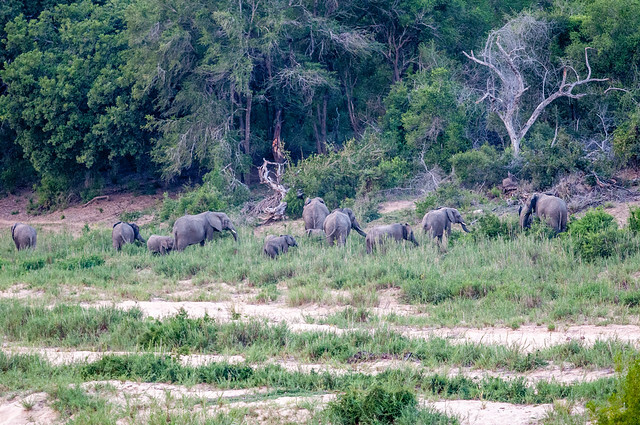 We had elephants outside our room the first night (everything is unfenced). Someone walks you to your room every night as all the rooms are in separate out buildings from the main lodge. Monkeys and impala are all over the property. Six drives down to go, we have seen more than we ever could’ve hoped for + a herd of 300+ Cape Buffalo. Thanks for all of this planning to Ute Sonnenberg at Roho Ya Chui!! Slow wifi. All photos posted on Facebook public album here. 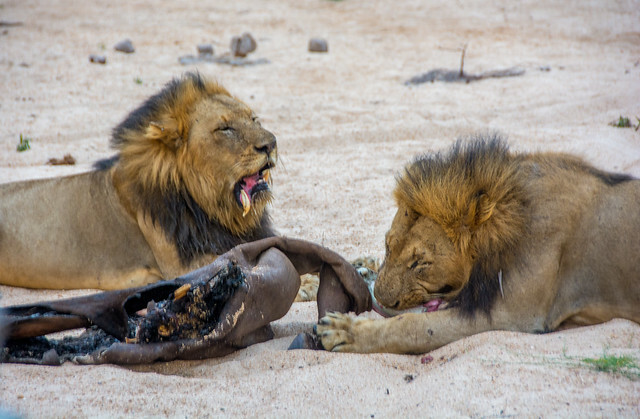 Our first game drive was with our ranger Barney and ranger David who speak their native siSwati when talking to each other and English when talking to us. They are amazing and use a combination or tracks and dung to spot things. 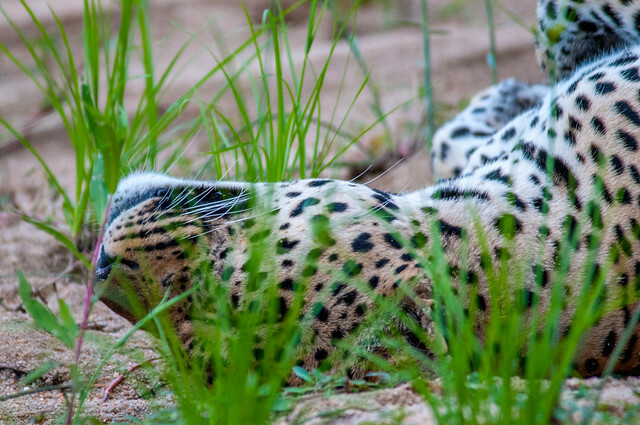 10 minutes into our first dive we found a leopard sleeping in the Sand River bed. Once the sun started to go down, he awoke and sauntered across the river. Dozens of impala and other antelope things and then a stop for a gin and tonic in the bush before returning to dinner. Uneventful flight from Heathrow. Sleeper seats provided a good 6 hours of sleep helped by some champagne. Three hour layover in Skukuza before taking a small plane to Skykuza Airodrome which is a single strip of tarmac with an open air terminal and a novel baggage claim. Arrived at Kirkmans to a beautiful room and are waiting to go out on our first game drive after tea. Arrived safely in London Heathrow. Both slept 5 hours which on a 7 hour flight is great. It’s just before noon here and our flight leaves at 7pm so the whirlwind sightseeing trip we planned is shelved. The lounge here is spacious and has a spa and showers within it; both nice adds for a 35 hour trip. Realized after our flight arrival was delayed to headwinds that we wouldn’t have any productive time to tour London on our layover. 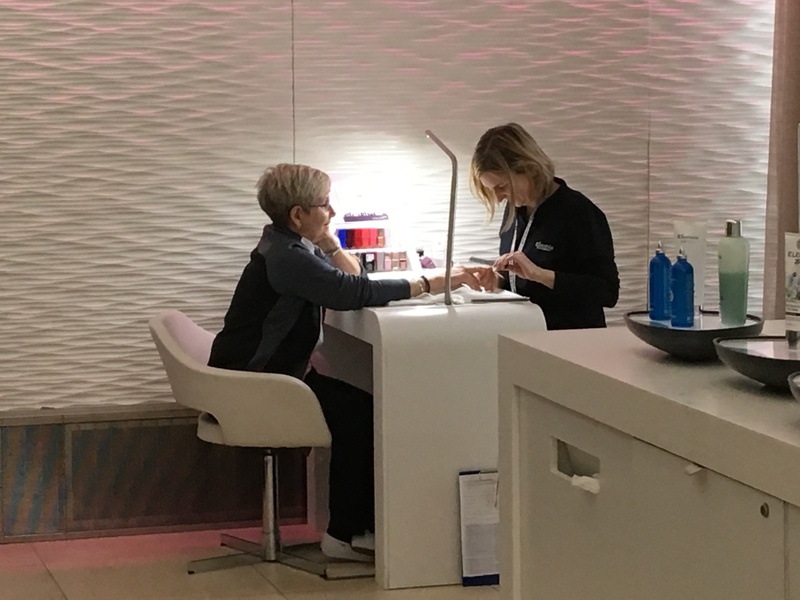 So we will take advantage of the BA Lounge and spa in Heathrow during our 8 hour layover. 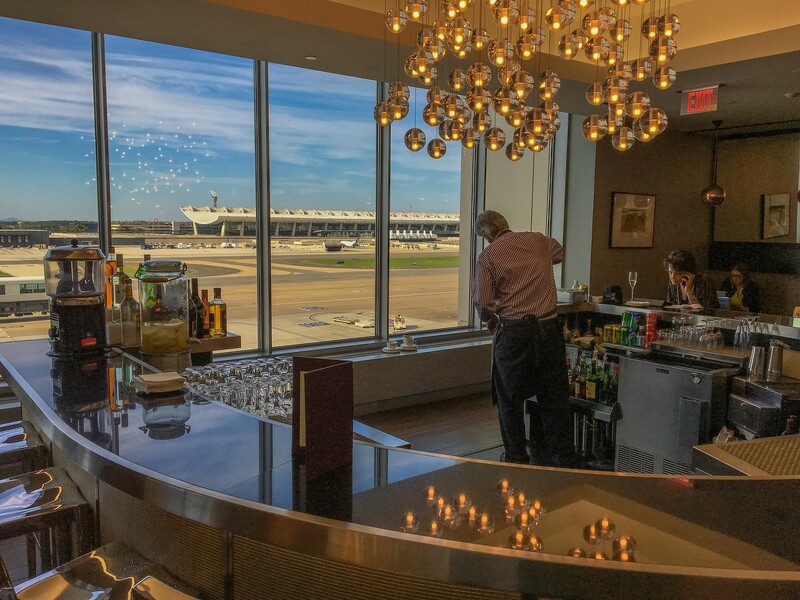 Meanwhile the lounge in Dulles is quite good with sit down dinner seatings and hot and cold running free beverages. We made friends with Habib from Afghanistan. He left in 1979 and I was nearby in Karachi in 1980. 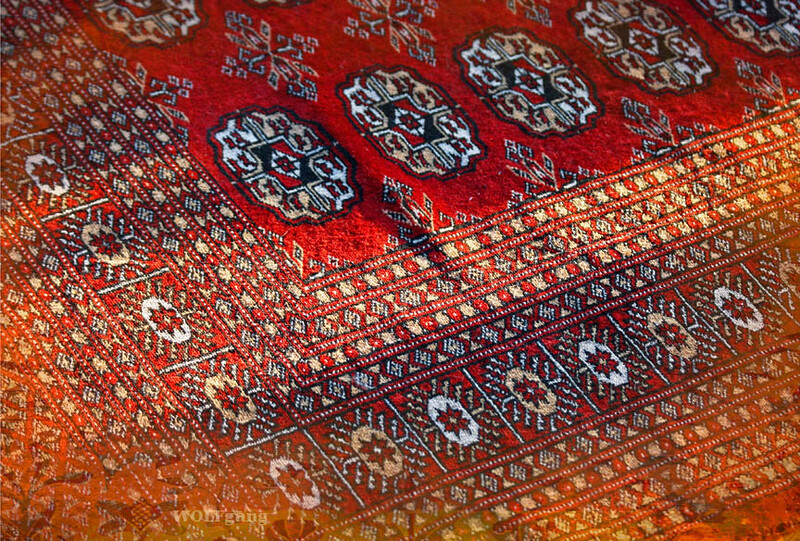 Great conversations about handmade bokhara rugs I brought back! Always meet interesting people when traveling! More photos and videos on Facebook and Flickr! Well, checking in last night took an hour (until midnight!!). Checked in for Washington–>London–>Johannesburg. 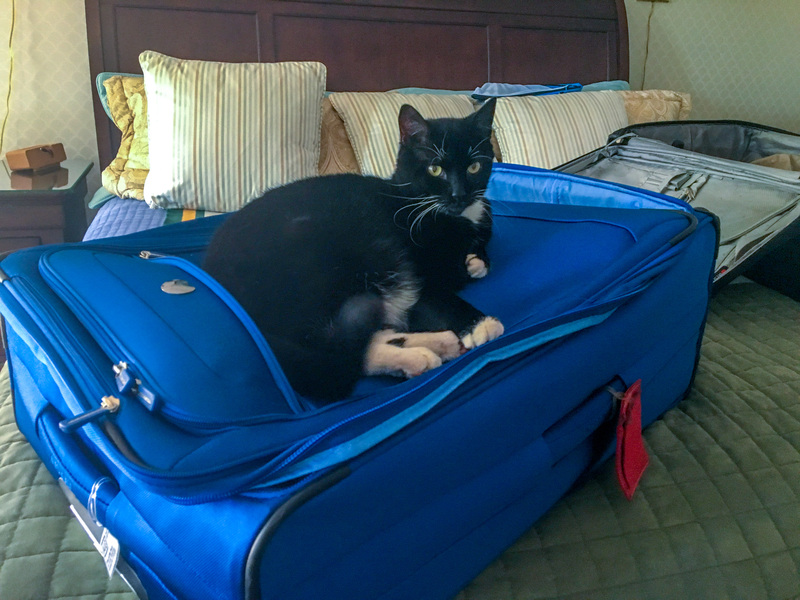 Lisa doesn’t have frequent traveler status so she has two choices. Pay $135 a leg to pre-select or select at checkin 24 hours out. So, you checkin for both flights but they want to charge $135 for seat selections on the connecting flights as it was more than 24 hours for London–>Johannesburg. This is after I called 5 hours earlier and explicitly asked this question and was told “no problem.” After 45 minutes and 2 supervisors they waived the fee. Apparently all international carriers have adopted this policy as another way to make money but it’s the worst customer experience in the world. Today is the last work day this month and after today I only have 8 more before “retirement”. I say that in quotes as you never know what the future will bring. Have to stay up late tonight to check in (24hrs before my 1020 PM departure tomorrow from Dulles) and get a British Air seat assignment for the Heathrow–>Joburg leg. Even at outrageous British Airways Club World prices they charge $135 to get a seat more than 24 hours before checkin. “WTF”. Since I have status on AA I was able to get a seat assignment for myself and now I have to stay up so Lisa and I can sit together on this 11 hour flight. For a $7,000 ticket, this is ludicrous (speed). S Mack Peters ( a less wild cat) is also ready to get rid of us as shown by the photo below. He realizes he can be packed and we are still under the 40kg limit. There had been a lot of planning on this trip as the 10 days after our safari ends I planned mostly myself with help of our Cape Town friends Mary und Karlheinz as well as booking.com and AirBnB. I even purchased South African maps on microSD for our Garmin (US$99, don’t know how they stay in business) so we could navigate the Garden Route in our rental car without worrying about wireless data. And of course making sure we had all the necessary accoutrements for our fun excursion with the Great Whites in Gansbaai.